The circles are round and aligned with one another so that the undercut creates 360 degrees of diametric opposition that will hold the registration firmly in place even if the facial of the bite requires 90 degrees of cut back. When seating the bite post into the stone model, on occasion it may be necessary to reduce stone around the implant entry site to be certain that the Bite Post is fully seated. When sending the case to the lab, always remember to clearly identify which bite post belongs to which implant site. 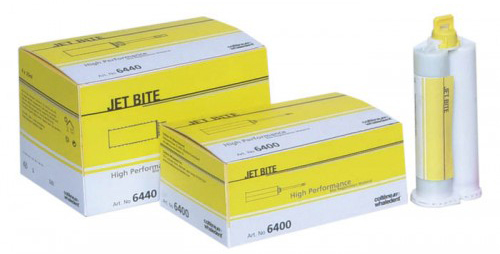 Always use high consistency polyvinylsiloxane addition type bite material like Jet Bite™ by Coltene-Whaledent. These softer memory perfect materials can easily be navigated on and off the Implant Bite Posts™ without any change in the bite. Never use rigid or crumble prone bite material as the undercuts in the Implant Bite Posts™ will likely destroy the bite registration.